During the summer holiday period, and under the Memorandum of Understanding (MoU) signed with Dublin Institute of Technology (DIT) in September 2017, 15 L7 Engineering Students selected from courses run at DIT and IT Tallaght (ITT) took part in a pilot program of hands-on electrical and mechanical troubleshooting and semiconductor fabrication activities. In an accredited 2 week pilot program entitled “Continuous Professional Development (CPD) in Manufacturing Operations in Cleanroom Environments”, the students attended the FIT (Fast Track to IT) Centre in Celbridge, where hands-on learning on the customized electrical and pneumatics training panels was undertaken, as well as exercises with mechanical gears and linkages. In a second week hosted by ITT, semiconductor capacitors were fabricated in the fab lab, using typical silicon wafer cleaning, deposition, lithography and etching steps, and ultimately device measurement to understand the quality of the process work undertaken. 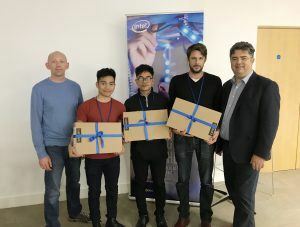 The fabricators of the best group of devices were awarded a prize of an Intel powered Chrome notebook each. A full day was then hosted by Intel Ireland, when the students received a safety presentation by Jennifer Deeney (“It won’t happen to me!”), followed by a site tour, and then the LEAN Manufacturing course, a team-based hands-on exercise in optimizing model racing car building. This CPD course was designed with the intention of increasing awareness of the type of work performed in advanced cleanroom manufacturing environments, and also to enhance the hands-on trouble shooting and problem solving skills of potential future Manufacturing Technicians (MTs). The activity was carried out under the “Talent Pipeline” strand of the DIT MoU, whereby the awareness and interest of students in future MT roles is being targeted. The pilot program will now be fully evaluated by the pilot students, academic staff and Intel, and ways to grow and sustain this CPD activity within many suitable L7 courses across the ITs will be investigated and implemented in order to make available to a much wider cohort of future talent.